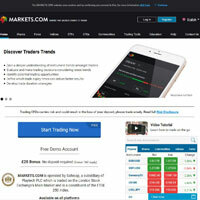 Markets.com is an online broker which offers its clients access to Shares, Forex, Indices, ETFs, CFDs and Commodities trades. It includes several trading tools, webinars, plus 24 hour support, zero commission and competitive spreads. As with any trading website, it’s important to remember that you can lose, as well as potentially make, capital. Access to Shares, Forex, Indices, ETFs, CFDs and Commodities trades. 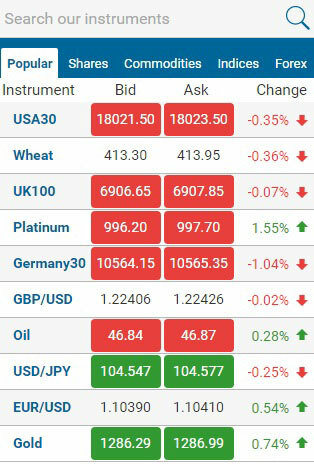 Markets.com offers various trading tools: Economic Calender, Economic Events, Markets Consensus, Traders Trends, Trending Central, Trending Now, Events & Trade, Weekend Trading. Together, these tools can help amateur and seasoned investors alike invest wisely and keep abreast of relevant economic events and the latest trends. These tools are explained fully in the "Trading Tools" drop-down box in the site's navbar, so we will not cover them individually here. Markets.com gives you access to NonFarm Payroll Reports and IPOs, plus you can learn about trading through engaging webinar sessions. A guide to trading basics can help anyone who’s new to online trading, plus there are market-specific educational pages (for Forex and CFD traders). Technical and fundamental analysis notes are provided to help you better predict future investments, and you can easily find instant quotes on current buy-sell prices. Search Market.com instruments for instant quotes. If you’re new to online trading, then, there’s plenty of content to help you find your way around. You can also try the site’s free demo accounts, which let you practice trading without having to risk losing money. 24 hour support is also available 5 days a week, through a live messenger. Now let’s take a look at the key markets open to clients who choose Markets.com to trade online. Trade on more than 25 of the world’s major indices markets, including Dow Jones, Nikkei, FTSE 100 and more. You can gain the maximum benefit from smaller investments, with up to 150:1 leverage (default leverage of 1:50. T&Cs apply), and may analyse your results using technical charts on your mobile, web browser or tablet devices. As with all trades on Markets.com, there’s no commission to pay. Invest in oil, gold, coffee and many more options. The commodities available on Markets.com are some of the most expansive we’ve seen, with options you often don’t find elsewhere. You can also trade with 200:1 leverage (default leverage of 1:50. T&Cs apply), with tight spreads so you can get more from your investment. If you’d like to try your luck without risking your money on the commodities markets, you can also open a demo account. Easily view current rollovers and their expiry dates. CFDs allow you to build varied portfolios in currencies, business bonds and shares, indices and more. The site contains plenty of details on each, including trading hours, with the ability to search instruments for current bid and asking prices. Markets.com gives you excellent Forex trading opportunities. Trade over 50 top international currency pairs, 24 hours a day. Real time quotes provide you with an opportunity to catch deals, with up to 300:1 leverage (default leverage of 1:50. T&Cs apply). Spreads start from 2 pips and there are no trading fees or commission. Charting tools allow you to keep track of currency pair trading prices, in a bid to help you predict market shifts. Markets.com provides a great space for accessing a wide variety of instruments. It also has a great selection of really useful trading tools and a variety of webinars, which ought to benefit anyone who is new to online trading. We were particularly impressed by their selection of commodities, shares and bonds. This is an overall high hitter, with plenty of items and markets to explore.